Started 3D printing in April 2017 with a "brand" printer from our Chinese friends, (no i am not gonna give you the name of the three axis brand, lol) and watched some 3D printing video's throughout the web. As soon as i saw a Delta printer i knew i had to have one of my own and bought a DIY kit. Ever since, i'm almost constantly trying to improve my printers setup, so i now jump from one controller board to another, first board was the Mega2560, second a rumba board for the 3 in 1 diamond head, now trying a ultrasonics board, and a lerdge board with touch screen and some additions is already on it's way. why? Because i'm curious and i want to learn as much as i can. By the way, this is all just pure out of hobby interest. What have i learned so far? Marlin FW is also a big player and for the AVR platform (8-bit) and is doing a serious effort to do so for the ARM platform (32-bit). Repetier is also developing on both platforms and competition is never been a bad thing. I used Marlin for the mega2560 and the Rumba board and for the Ultratronics pro V1.0 the Repetier config tool(development part) has won, because the Marlin configurator just gives me a bunch of compiling errors. So here is my story so far, i'm now a proud owner of a Rostock Mini G2Spro and a XYZ da Vinci pro. 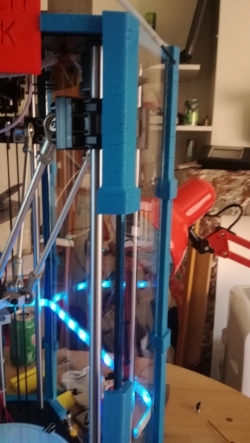 Plans of making a Kossel XL are already forming up and will be my winter project.